Our twins from Sagkeeng are ready for adoption! Ted is usually the first to come for a cuddle. He often carries toys in his mouth, will purr at the slightest touch and likes to watch TV. Bill, on the other hand is the first to check out new things and also likes to watch TV. He enjoys cuddling, loves toy mice and can play for hours with them. He has a more dominant personality and likes to tell Ted what to do –typical twins! 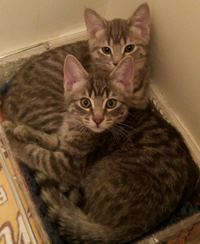 If you would like to meet Bill & Ted, you can visit them at Pet Valu Sage Creek, during regular store hours.